The vision behind The Bistro at Gateway City Arts is to provide a healthy, fresh, and locally- sourced dining option. One that is also reasonably priced while offering eclectic choices, that merge classic favorites with just enough of an innovative spin to intrigue the adventurous palette. We serve lunch, dinner, and Sunday brunch and have a full bar with 12 taps, classic and signature cocktails, wine, and beer. In addition to our classic beer selection we are proud to feature artisanal craft brews from the region’s breweries. 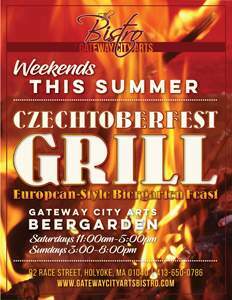 During the summer months our beergarden is open, on weekends we host a European BBQ and you can often find free entertainment taking place. Every Wednesday, with rare exceptions, we host The Wednesday Tunes Series, free music by local musicians from 7-9pm. Starting at the end of June, we are excited to host Family Game and Fresh Pasta nights!